St Agnes Museum feels extremely honoured to have been given this gold watch, a precious family heirloom, by Miss Ruth Pearce who wanted it to be conserved and its mining history kept alive. The watch was purchased by Walter Henry Goard, Ruth’s uncle, while he was mining in America. His initials are engraved on the back. We are very grateful to the Tufnells, Ruth’s good friends, who researched the watch’s origins and family history, and took this photograph. 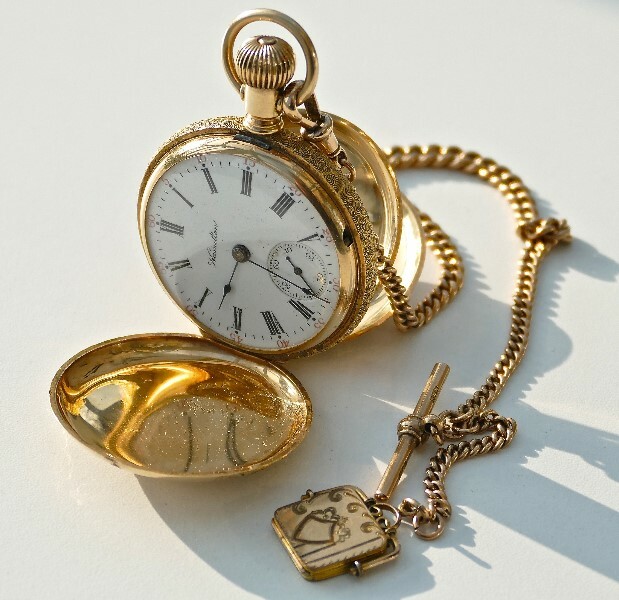 It is an American “Railroad” pocket watch, with a Hamilton movement and a 14 carat three-coloured gold keystone case, set with a small diamond. It has an English chain and locket with photographs of two children, yet to be identified. We would love to know who they were. The watch was made in Lancaster, Pennsylvania, in around 1911 and we will be displaying it, together with more information, in our brand new cabinet bought with generous help from the Local Improvements Committee.